Readers take a whirlwind romp around the globe... exploring 24 different places through rhymes, photos, maps, and interactive activities, including crafts, recipes, games, and recommendations for music and books. This review focuses on the last chapter of the book, “Z is for Zimbabwe.” Fitts has selected interesting anecdotes and examples of cultural attributes to introduce readers to this nation. Her treatment of the history of the Great Zimbabwe is accurate, and she makes clear the importance of this period of history to Zimbabweans today. Her language selections are excellent and help readers understand common courtesies in Zimbabwean cultures. Selections for becoming acquainted with Zimbabwean food, literature and geography are well done, and her inclusion of phrases in the Sindebele language is accurate and appropriate, even though Shona is spoken by over 80% of the population. The central weakness of this chapter is its overemphasis on the role of white people in Zimbabwe’s history. Out of thousands of years of Zimbabwean history, white people held military and political control for 90 years, and that hegemony ended 35 years ago. Fitts’s article, in general, uses too much of the limited page space to describe artifacts of the white history: stamps of Southern Rhodesia, for example, and a brief biography of Cecil Rhodes’s life. These are not at all necessary. She could have, for example, taken a look at the spread of Christianity in the country and the role of the independent churches now flourishing there. Alternatively, she could have discussed Zimbabwean literature in greater detail; it is rich and provides an authentic look at the political issues she raises. In the same vein, the author devotes three quarters of an entire page to the question of land ownership in 1965. She discusses the fact that whites took the best land for themselves and left the poor land to Zimbabweans. She comments “They (whites) were very successful at commercial farming techniques. . . . While whites felt that they brought the know-how to extract wealth from Rhodesia’s soil and worked hard to do so. . . “ (p. 319), But she fails to state that the white farms flourished because of black labor. This is a major flaw in a discussion of the land issue in Rhodesia. Basically, this is a reasonably good introduction to the country, provided the teacher can tone down the overemphasis on white contributions to Zimbabwe’s history; it lasted such a short period of time. Hi, I’m Ruth Fitts, author of Australia to Zimbabwe. I’d like to thank Dr. Crofts and Africa Access for reviewing my book. I particularly appreciate Dr. Crofts’ suggestion that I add information on how poorly paid black workers contributed to the wealth of white farms in Rhodesia. That’s an important part of the economic picture that I and my Zimbabwean editor failed to include. I will be adding that information to the next edition. The Zimbabwe chapter covers more historical eras than most countries in the book. The focus is on periods that particularly shaped the Zimbabwean cultural identity including the Monomotapa Empire (Great Zimbabwe) and Chimurenga (the struggle for black rule). It also covers land reform in the early 2000’s, describing the historical inequalities that drove the need for land redistribution in Zimbabwe. If you are a Zimbabwean or an African studies scholar and you have suggestions for changes to “Z is for Zimbabwe,” or any other of the African countries in the book, I’d love to hear them. Each chapter in the book had many editors pre-publication (including scholars and people from the country), but there are always new insights, ideas or errors that we missed. 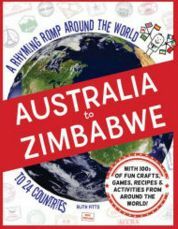 I am currently preparing the second edition of Australia to Zimbabwe and I am always looking for ways to improve each country introduction for kids. Please email me with your suggestions at contact@australiatzimbabwe.com. Africa Access has been a wonderful resource and aid in improving Australia to Zimbabwe, providing important feedback and advice pre-publication. I’m delighted that they are still pushing the book further in the right direction post-publication. Africa Access’ contribution to improving children’s literature about Africa is invaluable for teachers, parents, kids and authors like myself. Previous story May I Have This Dance?